Which Is the Best Nursing Cover -- Milk Snob or Covered Goods? Is modesty important to you? Do you hate the idea of giving strangers a show when you’re trying to feed your baby? If you’re worried about that, your best bet is getting a modest nursing cover that will keep your privates, well, private. Two great ones to consider are the Milk Snob and Covered Goods — both provide great all-around coverage. As you will notice from the following comparison table, these two products are almost identical when it comes to their specifications. Where It’s Made U.S. U.S. 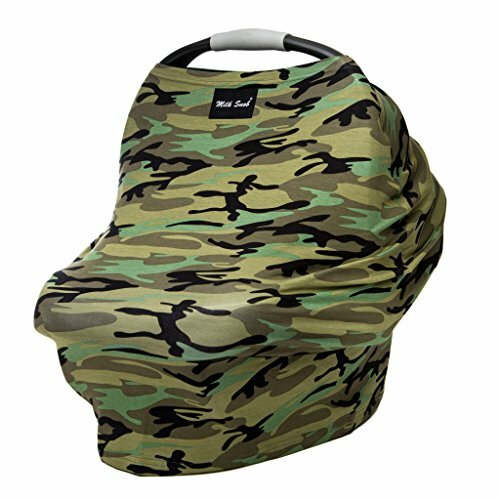 This is a multi-purpose nursing cover that you can also use as a car seat cover, cover for shopping cart, a blanket, or a highchair cover. When you use it for breastfeeding, you can be comfortable that nothing will show unless you want it to. The product has become a household name with breastfeeding mothers since appearing on the reality show SharkTank and receiving a $150,000 offer from Lori Greiner. Four-way stretch helps it fit on a variety of car seats. It’s pretty hot to use for summer. Not a great choice for pumping. You should hand wash it, not machine wash.
Let’s look at some of the key benefits of using The Milk Snob. This stretchy nursing cover is easy to use whether you’re using it for breastfeeding in public, or you’re trying to put it on a shopping cart to protect your baby from germs. Since it offers four-way stretch, it’s easy to fit onto the products you’re trying to cover it with — like car seats and highchairs. It’s hard to make a quality nursing cover that serves so many purposes, but the Milk Snob seems to do the trick. The four-way stretch fabric lets it retain its shape, but also makes it easy enough to stretch over objects of different sizes. When you’re a mom, you already feel like you’re struggling just getting out the door with all your baby gear and your baby. So it helps when you don’t have to feel like you’re in a life-or-death wrestling match with a shopping cart when all you want is to protect your baby from germs. And because The Milk Snob is so big, it does even stretch over big shopping carts, not just the smaller ones. But you should be aware, once you stretch it out really big, it can seem to lose some of its ability to snap back. This nursing cover doesn’t come with a pouch to store it in while it isn’t in use, which would really help keep it cleaner if you don’t want to wear it all day and just want to stick it in your diaper bag for when you need it. Plus, it’s best to hand wash this item when it gets dirty, which isn’t the best for busy moms who would rather toss it in the washing machine. What Makes The Milk Snob Better Than Covered Goods? Both the Milk Snob and Covered Goods nursing covers are very similar. No matter which one you go with, they’ll be stretchy and soft. It’s a tighter fit: If you’re after a snugger breastfeeding experience or if you generally shop at stores where the carts are a little smaller, you might want to go with the Milk Snob. It’s not as wide and it’s shorter than the Covered Goods nursing cover is. It’s better for petite women: If you’re a shorter, smaller woman and you’re worried you’ll be swallowed up by a bigger nursing cover, keep in mind Covered Goods is several inches longer than the Milk Snob. You might feel more comfortable with the Milk Snob on. 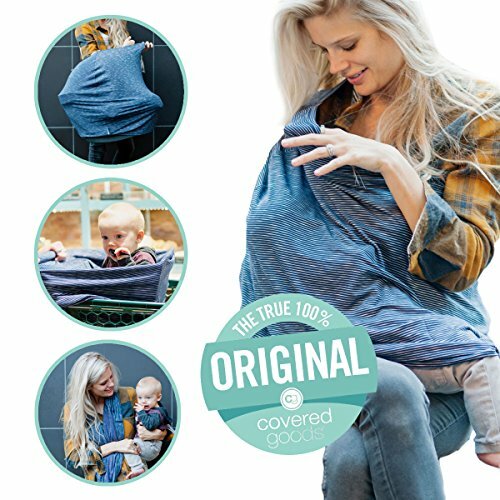 It’s a better scarf: While you aren’t buying a maternity cover solely to use as a scarf, if you do want to wear it around instead of sticking it in your diaper bag, the Milk Snob is a bit better to use as a scarf than the Covered Goods cover. Because it isn’t as wide or as long, it seems like it’s most comfortable than Covered Goods is. Covered Goods has four uses — it can be a nursing cover, car seat cover, infinity scarf, or shopping cart cover. Not only will it help keep your hoo-hoo’s hidden while breastfeeding, but it can also protect your baby from germs, sun, and wind. It’s made from 5% spandex which gives it that extra stretch and versatility. Longer than some other nursing covers. Wider than some other nursing covers. It’s easy to clean — you can put it in the washing machine. Might be too long for petite women. It can be a bit wide to use as a scarf. Let’s look at what Covered Goods can offer moms. Covered Goods is easy to use, but some of its uses are a little simpler than others. When you’re using it as a nursing cover, it’s pretty straightforward when you’re trying to figure out how to use it. It’s more difficult to use when you’re trying to use it as a shopping cart cover. It can be hard to drape properly onto the cart until you get the hang of it. As a scarf, you’ll have to keep winding it around and around so it circles around your neck several times, otherwise it will want to slip off to one side or over your shoulder. When it comes to working as a nursing cover, Covered Goods is well designed. It’s long enough that women won’t have to worry about showing off their lower backs while they are breastfeeding. Plus, it’s wider than many other nursing covers, which means it’s a good choice for bigger women too. The biggest downside to the build quality of the Covered Goods nursing cover is that it can feel like it is starting to lose some of its ability to spring back into shape once it is stretched out too much. Although this doesn’t come with a carrying bag so it will stay fresh and clean when you aren’t wearing it, the Covered Goods nursing cover is easy to clean. It can go in your washing machine on the cold setting. And when you are done washing it, you can even put it in the dryer on low heat. That makes things a lot easier for busy moms who are too tired or frazzled to add hand washing an item to their to-do list. What Makes Covered Goods Better Than the Milk Snob? Depending upon what you’re looking for in a nursing cover, Covered Goods does offer some benefits the Milk Snob doesn’t. It’s wider: Covered Goods is a little wider, which means that it may be a better choice for plus-size moms. It’s longer: This nursing cover is several inches longer than the Milk Snob cover is. That means you’ll be able to cover up your lower back and backside a little more when you’re breastfeeding. That can be a big perk for moms who are worried about modesty or who are wearing lower rise pants as their C-section incision is healing. It’s better for bigger shopping carts: If grocery shopping for you means loading up as much stuff in oversized carts as you can, then the Covered Goods cover would be a good choice for you. Because it’s wider and longer, it can adequately cover up even really large shopping carts. Because these nursing covers are both multi-purpose and so similar, it can be difficult to choose between them. No matter which one you choose, it will be soft and stretchy. If you’re a petite mom, the Milk Snob cover might be a better fit for you because it is narrower and shorter. You won’t feel like you’re being swallowed up by the cover when you wear it or use it as a scarf. If you’re a plus-sized mom or a tall mom, you may want to go with Covered Goods because of the extra width and length it offers.